When I first arrived at Woodstock in 2011 for the start of fourth grade, I moved to Edgehill, the elementary dorm at the time, where I was surrounded by weeping classmates, attentive dorm parents, and an especially caring staff member, who everyone called Deepa-ji. Whenever I saw Deepa-ji sweep the hallways of our dorm, she was always happy, smiling to me every time she looked up. After I left that dorm and moved down to Ridgewood and then to Hostel, Deepa-ji, too moved to Alteridge, and I continued to see her making everyone around her happy. Nowadays, whenever I walk up the mountain to school and see a middle-aged woman approach in a pink jacket, I become happy, awaiting the loud “Namaste!” The woman passes. It’s not Deepa-ji. She keeps her head down. I keep my head down. Nothing happens. Deepa Godial, age 48, long-time dorm employee, passed away a week before the start of this school year. Many students remember her fondly. “She was our second mother,” Joanna Victor, Class of 2020, said, remembering how Deepa-ji used to care for her when she first joined the school in fifth grade. Deepa-ji would braid students’ hair, bathe them, help them make their beds, and help tidy up their rooms. “For me she was way better than a dorm parent, ” Victor said. In the lives of 9 year olds who have just left the comfort of their families and homes, Deepa-ji—with her strong sense of morality, kindness, and compassion—played an instrumental role in their development. “I wouldn’t have been independent without her. When she did stuff for us, I learned how to do it in her way,” Saira Mehra, Class of 2020, said. Additionally, the homesickness that a young child experiences in boarding school was alleviated by her character. Even after the youngsters moved to other dorms, Deepa-ji greeted them on her way to work. “She was the person with the pink jacket who said ‘Hello!’ to everyone,” Mehra said. Angmo, who knew Deepa-ji since third grade, even bought back a present for her before returning to school this year, but it was too late. “Last time I’d seen her, I promised her that I’d get her this scarf she really wanted. I came back to give it to her, and I heard from Mr. John that she passed away,” she said. In the middle of the night, Rajkumar Taak, an employee at Alteridge dorm, received a grim phone call regarding his fellow colleague and mentor, Deepa-ji. Her death was preceded by her gradual build-up of blood pressure, resulting in swelling around her body. According to Suresh Kumar, her husband, Deepa-ji walked from the top of the hill near St. Paul’s Church to dorms four times a day. “She would go to work first, then return for lunch, then go back at 5 p.m., and then come back at night,” Mr. Kumar said. Additionally, she worked six days a week. “She always used to say that whenever it was time for duty, my kids [at dorms] are waiting. My kids will be troubled,” Mr. Kumar said, reflecting on Deepa-ji’s work ethic. Before she joined Woodstock in 2006, she used to work in Mussoorie’s government office, the Nagarpalika, as an employee. In her time there, she received an award for her commitment and attitude towards her job. Similarly, after she joined the school, she received an award for her contributions to a healthy environment between employees and residents of the school and her dedication to the girls she took care of. During her life, Deepa-ji abided by strict morals. Mr. Taak said that she would say that “if there was any foreign person, do good to them.” Furthermore, she was also notorious for kicking out boys who tried to go into the girls dorm outside of the approved timings. When it came to money, although she came from a poor background and status, she held up with her sense of fairness. “If she borrowed money, she would return it the next day, even if it was 10 rupees,” Mr. Kumar said. Deepa-ji’s departure has had a massive impact on her home and family, which is situated near Char Dukan. Inside their small home of two rooms, one can see that everything is sparkling clean: the bed sheets are straightened, the floor is dustless, and the pictures and clothes are kept in order. During her day off, Deepa-ji would clean their house, with Mr. Kumar assisting. “She would wash the clothes, and I would dry them on the roof so that she wouldn’t get sunburned,” he said. Mr. Kumar also made her black tea in the morning, before she went to work. Asked about how they met, Mr. Kumar talked about how they had an arranged marriage, and how she took him to Mussoorie to settle, which was particularly hard as he had lived in a village all his life. “I was a village man. She taught me how to live in a city, how to talk to other people,” he said. Furthermore, their first few months in Mussoorie were difficult. Mr. Kumar recounted how they had to “sleep on cardboard on the floor” when they worked for other people as servants. 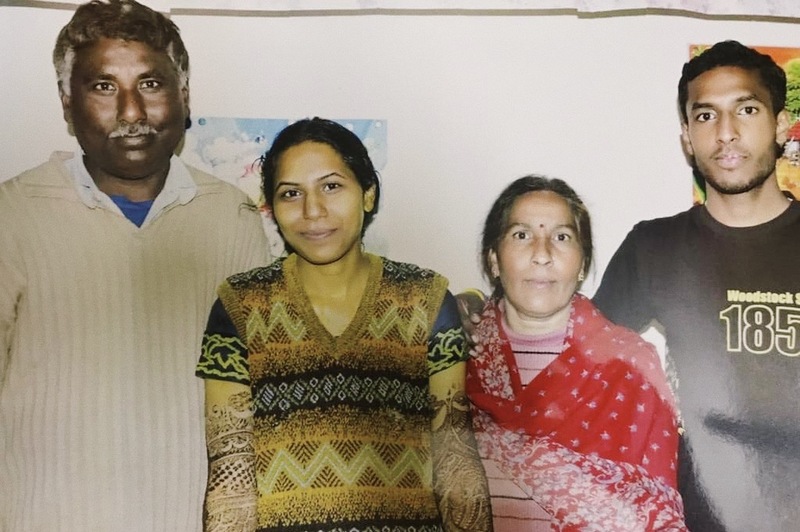 Through their struggles, the young couple worked together to build a life for themselves and their children in the hills of Mussoorie. Mr. Kumar fractured his right arm, rendering it useless for a period of time. During this time, he sobbed, Deepa-ji would feed him food in bed, help him get up, clothe him, and bathe him. She would even cook him eggs and make him drink milk so that his bones could grow stronger. Now, Mr. Kumar is alone, crying with only his son at night: “Sometimes I lay down over here, sometimes I lay down over there,” he said, pointing to opposite ends of his bed. Currently, Mr. Kumar’s son, Sunil Kumar, is unemployed. This has caused much financial difficulty for the family, as his daughter has moved away to Haridwar, where she currently lives with her husband, and the passing of Deepa-ji, who supported them with her Woodstock salary. “My daughter has left me. I have no money. I have no one,” he reflected. “We are very troubled, sahib,” he said to me. “My son is unemployed. We find it hard to get even two rotis a day. The whole world eats roti: some roti I will eat and we’ll get a little stabilized, be back on our feet. Please help us,” he said. Mr. Kumar finds it difficult to be alone: “When you take a fish out of its pond, it starts flailing and gasping for water. I am that fish,” he said. As Deepa-ji’s ashes merge with the holy Ganges, her house stands still, alone, with a sparkling floor turning dustier every day. “What should we do?” Mr. Kumar said. “Time has played its game. In front of time, no one can win. Time is God. Whatever it does, it does with its own will. Thank you for writing this. Deepa-Ji was what made my Edgehill experience so amazing. She taught me everything I needed to know as a nine-year-old, from making my bed to just helping me settle in. Incredible writing, Dhrub! Although I did not have the privilege to know Deepa-ji myself, this article paints such a vivid portrait that I feel like I know her now. I am touched, and I hope Woodstock can do something to help support her family. I am saddened by the news of passing away of another good soul! An epitome of strength, self respect and compassion was Deepa ji. Will always be remembered fondly.